This is the front cover of my recipe journal. The papers, letters and flowers etc all came from "Deja Views" - "Apple". The rubon is Scrapbook King (from Lorraine). I love the colours, looks fabbo! Sensational. Was it easy to do? Those diagonal strips of paper work so well. Terrific. This looks brilliant.. I love the bold colours! Wow looking good Joey. Love the colours and the flourish. 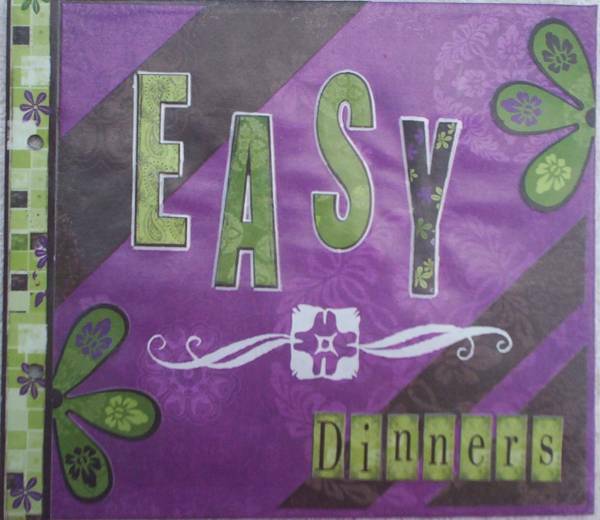 I love the diagonal stripes and the "EASY" title looks great! What a great cover, love those colours together.